Hello - I am trying to raise money for my Father and I decided to dig deep and sell off some items. I have had this doll for years and thought it was cool because it had springs. Someone told me it was about 1895 - French. It has French tag on dress and a French cross of Lorraine around its neck. The back of the head is kinda dented in which I was also told was a signature or mark. It was mentioned that it resembled baby Jesus in the manger and these were given as gifts? Then someone else suggested it was from around 1915? Try The Golden Glow of Christmas Past Facebook Page. They specialize in antique Christmas; they would be a lot of help. 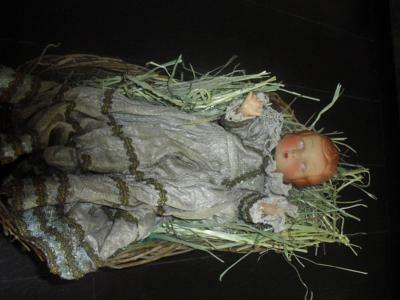 This baby does look like the Baby Jesus from a crèche; such dolls, also called devotional dolls, have been made of wax in France for sometime. I can't tell from the photo, but some dolls like this sell for up to $200 in good to fair shape, but closer to $75 might be a good price. Try posting on etsy.com; they are user friendly. Good Luck!